JEE Main Cut off 2019 are the minimum marks that candidates are required to obtain in order to be eligible for JEE Advanced. NTA JEE Main cut off marks will be available along with the JEE Main result on 31 January 2019. To check JEE Cutoff 2019, candidates are required to log in to the online result portal. Aspirants must note that the JEE Main cutoff will be different according to the category of candidates. Apart from the qualifying marks, JoSAA will release JEE Main Cutoff 2019 scores, on the basis of which, candidates will be granted admission to the participating institutes. Also, the JEE Main Cut off 2019 will be available for all the engineering branches of the institutes. The minimum NTA JEE Main cut off 2018 marks to qualify for JEE Advanced was 74 for General category candidates (OBC-NCL: 45, SC: 29, ST: 24, PwD: -35 marks). Candidates obtaining the this minimum NTA JEE cutoff marks will be shortlisted for the counselling rounds of NITs, IIITs and CFTIs. To get an idea of JEE Main cutoff 2019, candidates can check the JEE Main cut off 2018, 2017, 2016, etc. provided on this page. From this year onward, JEE Main will be conducted by National Testing Agency in various sittings on 6, 12, 13, 19 and 20 January 2019. Also, NTA has re-introduced the JEE Main normalization procedure. JEE Main Aspirants can check JEE Main cut off marks analysis, factors affecting it, previous years' trends, etc. from this page. JEE Main Cut off Highlights: The JEE Main cutoff scores of 2018 session were lower than that of the previous years'. How is JEE Main Cut off 2019 calculated? All the above-mentioned points are vital factors on which the JEE Main cut off scores will be prepared i.e. for qualifying for JEE Advanced and Qualifying for the pre-admission rounds of the JEE Main colleges. As mentioned earlier, there are two JEE Main cut offs, which are qualifying and admission cutoffs. NTA will be preparing JEE Main qualifying cut of and it will be available along with the JEE Main result 2019. To check JEE Main qualifying cut off, candidates must log in to their JEE Main accounts by entering the required credentials. Here, the candidates who have obtained the minimum JEE Cut off 2019, are eligible to appear for the JEE Advanced 2019. For each category of candidates, JEE Main cut off marks will be different. It is expected that the JEE Main cut off 2019 for qualifying will be much similar to that of the previous years'. The JEE Main cutoff scores will vary with the category of candidates. Through the previous year's qualifying JEE cut off, candidates can estimate the JEE Main cut off 2019. The candidates who are seeking forward to secure their admission in IITs need to pass JEE Advanced 2019. Total 2,24,000 candidates will qualify for previous year's JEE Advanced. JEE Main 2018 cutoff for general category, JEE Main cut off is 74, while for OBC-NCL is 45. Check the category-wise JEE Main 2018 cut off from the table below. Check the image below for JEE Main cut off 2018 scores required to qualify for JEE Advanced. JEE Main Cut Off trend table given below shows that cutoff for the year 2017 is the lowest of all in the last five years. The major factor for this can be increased in the number of qualifying candidates if considered. The candidates can compare the JEE Main Cut off for the last five year by following the table below. Considering the JEE Main 2018 Exam, the overall difficulty level for the paper was between moderate to difficult. Check the JEE Main Cut off Analysis below. The cut off of JEE Main 2017 for General aspirants was 81, which has been dropped to 74 last year. Also, last year the JEE Main Cut off for OBC-NCL was 45, which was previously 49. Accordingly, the JEE Main Cut off for SC and ST in the year 2017 was 32 and 27, respectively. That now in 2018 has been decreased to 29 and 24. It can be concluded that JEE Main cut off has been decreasing compared to the previous years. However, this year, National Testing Agency will be conducting JEE Main 2019. The test will be held in a computer-based format. Also, the test will be held in multiple sessions and each student will have different sets of questions. NTA has re-introduced the JEE Main normalization procedure since the test will be held in multiple sessions. Therefore, we can't come to any conclusion regarding the JEE Main cut off 2019 scores. Only after the JEE Main normalization procedure is being applied, JEE Main cutoff 2019 will be prepared. JEE Main Cut off score admission is the minimum marks required to be eligible for the counselling rounds of the NITs, IIITs and other CFTIs. The candidates must score the qualifying marks in order to participate in centralized counselling conducted by JoSAA. On behalf of the JEE Main Colleges 2019, JoSAA will be releasing the JEE Main cut off scores for admissions to these participating institutes. The JEE cutoff will be available for all the branches that these institutes offer and category-wise. However, this cutoff is also known as JEE Main opening ranks and closing ranks. Here, the opening rank is the top rank that got admitted to the institute, while the lowest rank to get admission is the closing rank. Please note that the JEE Main opening rank and closing rank will be different for each category of the candidate. Candidates appearing for JEE Main 2019 are advised to keep a track of the opening and closing ranks of previous years. 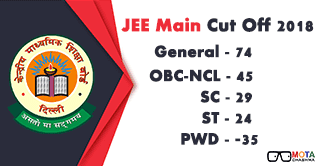 With the help of previous years' JEE Main opening and closing ranks, candidates will be able to estimate the JEE Main cutoff 2019. The table below provides the list of JEE Main cutoff 2016 i.e. the JEE Main opening and closing ranks of the various participating institutes.